I have spent much of my summer studying one of my biggest challenges... value. Value in art is the relative lightness or darkness of something. It is the basis for how us humans identify form. I have come to realize that I am often distracted by color and do not accurately identify values. This leads to unclear observations. Hence... time to slow down and put on my thinking cap! There are many ways to 'hone up' on your values. Using a red filter is a common one. The red absorbs all color wave lengths except red, leaving your view only to black and red. However helpful that this is, there are still a huge number of values left to put in order, which can be confusing. For this reason, it is common to work on choosing only a few 'grays', or values, to classify all shapes into. It comes down to making choices... just a few shapes and just a few values. This is a time to not worry about a 'painting', but to look in depth at simplicity and accuracy. Simple shapes and values. Give yourself permission to slow down and truly observe. From here there are many ways to advance your understanding of value. I recommend, however, sticking to this simple practice until it truly makes sense to you. After a full summer of careful observation of values, I am enjoying a new awareness and skills that I have developed throughout my summer of studies! 'Artist's to Watch' in Southwest Art Magazine! I am excited and extremely honored to be featured in the August 2017 Southwest Art Magazine as 'Artist to Watch'; the Editor's Choice for Up and Coming Talent'. I was fortunate enough to have an interview with Kim Agricola of Southwest Art. It is always healthy to review what motivates you to do creative work and Kim brought up interesting questions and thoughts... I hope that I have opportunity to meet her in person one day. Thank you Kim for a job well done! You can find the online version at http://www.southwestart.com/articles-interviews/emerging-artists/emerging-artists-michele-z-farrier or pick up a copy at your local newsstand. Imagine this - it is early morning and 5 below zero. You stumble down to the kitchen to make some coffee. While at the kitchen sink, you find that you are nose to nose with a snowshoe hare! I couldn't believe my good fortune. I ran to my studio and grabbed the first piece of pastel paper I saw along with a stick of vine charcoal and headed back to the sink. I figured a quick gesture was all I would get... but maybe two drawings if I was lucky. As time passed, I realized that I was actually getting time to do a decent drawing and the hare was still there... get the pastels!!!! I try to define what causes me to want to paint something prior to working. Of course, I was in a huge hurry, but it was so clear what was most intriguing to me. 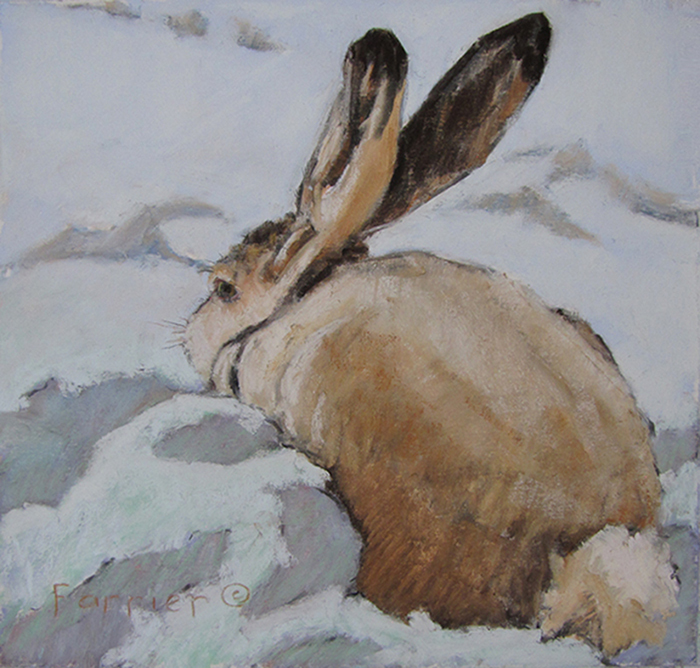 Both the hare and the snow were white, but one was a very cool white and the other very warm. It was an extreme contrast. Bingo! I was motivated even without some coffee! I think that due to the cold temperature and air movement, my little visitor decided that seeing movement through the window was a lesser evil than moving away from the building. He did keep a close eye on me though, which I tried to get into the painting. Michele Z. Farrier is very careful with her underpainting, in part because she always hopes that her piece will feel done to her from the earliest stages, when the abstract nature of the painting most simply but effectively states the scene’s feeling. Farrier will get tighter and more detailed when she thinks the subject matter demands it. My Pastels Came Out of Hiding! I have spent the last couple of years working primarily in oil paints as a means to get more comfortable with them. My new passion is for mixing color and playing with the intensity of those colors. I have learned an immense amount and am thrilled that I have stuck with it for a great majority of my last few years. I find that personal mark making gives me, as an artist and viewer, sensation of the artist's movement, which I find intriguing. Art that is full of layers and marks seems to have endless appeal to me. Developing this layering and mark making in oils is on my list of goals. I am excited to explore these concepts and techniques. However, as fall approached, I found myself craving the textures and 'brushy' quality that I have always loved using pastels for. My pastels were calling me! It took a bit of effort to change out the supplies in my truck and make sure that I had all that I needed... but I was primed! I worked on sanded paper 21x22 as I have traditionally done and had a blast! There were plenty of trees full of color, but I was seeking a scene that was more 'scrubby' and textured. I have not touched this pastel since I was in the field. I am pleased with the spontaneity of it and want to be judicious in changing the marks and affecting the energy that it has. I find it difficult to not 'overwork' while in the field and diminish some of the marks and energy. My plan is to develop some of this style while working in oils. The challenge is endless! I have long wanted to work more with the human form. It is something that I just do not seem to get around to tackling. I do frequent life drawing classes and have even attempted working in oils while studying the figure. That being said, I have never tried to develop a painting using figures... until now! The irony is this painting started out as a series of drawings done from an apartment window over morning coffee. While visiting, I couldn't believe my good fortune that I could see down into a construction site while all of the workers were heading off to their daily tasks! It was intense, early morning sun which cast shadows of a multitude of colors... I was in HEAVEN! I did not have my paints with me, but did have my every-ready sketchbook! I took photos, but found that most of my information for this painting was gathered from careful notes and sketches of figures and their shadows. Mind you, they were very crude and simple drawings... but enough to convey my own excitement to me at a later date. I stuck to my original idea for the most part. The focal area was the figure in front of the dark shadow. I included the shadow to the left of him as well as his own shadow. For this reason, I gave this area higher contrast with the building behind, more details and shapes that I attempted to connect. I struggled a little with whether to get 'ruler' straight with all of this construction, but felt that it would enhance the painting to leave lines freehand and a little lopsided. The front table definitely had that going on already and I felt that I wanted a sense of human quality in all of the geometry. The added painting bonus was the textures! I wanted to do the whole thing in concrete, it was so fun to paint! I even broke loose with a palette knife. I am inspired to get to work on some more figure paintings! In the meantime, however, I have the good fortune of attending a Jill Carver plein air workshop next week... Life is full of great learning opportunities! I was honored to be invited to the 2016 Santa Fe Plein Air Festival put on by the Plein Air Painters of New Mexico. The level of work from the 55 invited artists was humbling and inspirational. If you are in Santa Fe between June 9 and July 4, please visit the lovely InArt Gallery for a treat of a show! Everything in the gallery was painted by the 55 invited artists in 4 days... impressive! 'Looking toward Shade' Oil. 8x10. InArt Gallery. Each of the four painting days we had opportunity to join our colleagues at specific locations. The first day was at the pueblo of Chimayo where a pilgrimage was taking place. I got some great photos of the pilgrims coming from a variety of pueblos but choose to paint these two buildings while there. It was a warm day and shade was a true luxury! The second day was a fun adventure that I experienced with my newly acquired friend Cheryl. We headed past Ghost Ranch and continued on to a dirt road that followed the Chama River to a monastery. We did not make it to the end of the road, but came across amazing cliffs to paint... irresistible in fact! 'Morning Light' Oil. 9x12. InArt Gallery. The afternoon brought tremendous storm cells that lasted throughout the evening. The skies were amazing! 'Afternoon Build Up' Oil. 11x14. InArt Gallery. The Third Day we were lucky enough to go Los Luceros historic ranch. It is a working ranch that is owned by the state of New Mexico and is on the Rio Grande River. I have never seen such monumental cottonwood trees... the bosque! I decided to work toward simplicity this day as the amount of green and underbrush was overwhelming to me! a fellow painter, Tom was set up and painting in my view, which gave great perspective to the scale and temperature of the day. I hope to develop this painting at some point. Thanks for modeling Tom! Study of plein air painter at Los Luceros. Oil. 9x12. The final painting day I choose to go back to Monestary Road where I revisited cliffs. The sky was a bit hazy and was reflected in my painting, although the grandeur is hard to beat! The following days were spent hanging the shows, socializing and recovering. It is an experience that I will cherish forever. The show is incredible and inspirational... go see it if you have a chance! 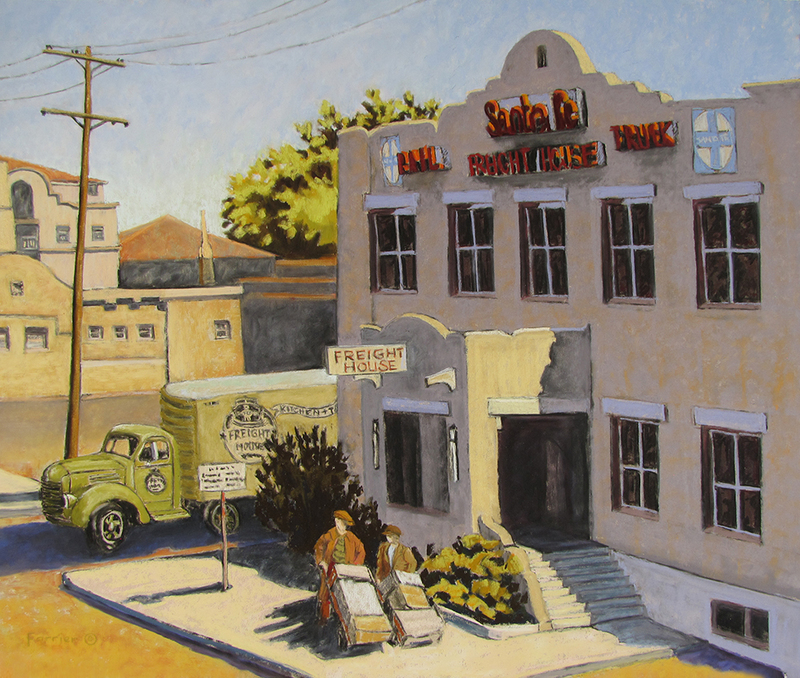 InArt Gallery 219 Delgado Street, Santa Fe, NM... you will not be disappointed! Thank you to Plein Air Painters New Mexico and InArt Gallery! You guys are AWESOME!!!! 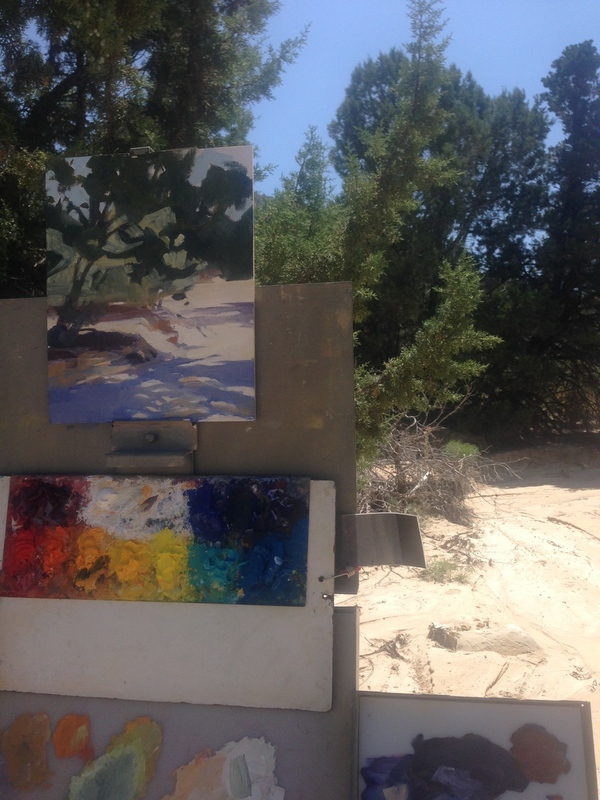 This is a documentation of the process that I use while working plein air, in the field. My initial work is done in the sketchbook looking at compositions and patterns made with light and shadow. These sketches are called 'notan' studies. Often it takes multiple drawings to feel settled with the composition. The second image is wash done in oils that mimics the notan drawing that I have chosen. It sets my lights and darks. While working plein air, this is very important as it keeps me from 'chasing the light'. I have a set composition and shadow pattern to adhere to. Third, I cover the canvas with color relationships (which would include values) as I see the temperatures of the colors. This takes a lot of practice, but allows color layering which I enjoy and find assists in conveying light, shadow and atmosphere... or, 'life'. From this point, I start putting in 'local' color (the color that appears to be true) being very careful to stay true to my color relationships. Some paintings are complete at this point. I take them home and look at them frequently for days or even weeks. This allows me opportunity to respond to them in many different perspectives, both emotionally and environmentally. When I do not have the painting calling out to me to 'come fix me', I feel it is done. After paintings are completely dry, I use Gamvar for a protective layer on the surface and they are ready to frame! Rather than avoiding the saturated green that is EVERYWHERE at this time of the year, I decided to go for it and do a study in green. This is easier said than done! This view is directly out of my east windows. I choose it so that I could work plein air, but be able to return to it throughout the variety of weather that June brings us here in the Tetons. The composition is fairly complicated, but I wanted the challenge to include both space as well as a large variety of greens and textures... I think that I met my match!!! As you can see by the layout, I wanted to play on the diagonals of the view. I have started laying in color at the point that I want to emphasize. Most of the greens were under painted in a variety of oranges and red violets. Overall, I am pleased with 'Kiss of Spring', although I still find myself getting more detailed than I want to be when using pastels. I left the foreground more impressionistic so that the focus would be more on the willow in the top right hand of the image. There are so many things to consider and keep track of in a work of art... the challenge is always there! Ned Jacob Workshop was a Great Opportunity! Boy, did I learn a lot with Ned Jacob! The workshop was designed to have students working plein air on paintings and drawing of horses... of which I know very little! Added to my limited experience and knowledge of horses, the weather was cold and wet... adding to the challenge. The interesting part to me, however, was that I was forced to look at subtleties due to the lack of light and shadow. Without a 6 day workshop scheduled, it would have been difficult for me to follow through with all of the challenges. I am so grateful for the experience! Ned was adamant about getting long lines and proportions set right away. I honestly could have spent the entire week just working on this! To watch him work was like seeing magic performed before your eyes. (By the way, the horse model is in the shed while Ned is sketching - we shared time out of the rain!) It was so inspirational! We had live horse models all week which was fantastic. Special thanks are in order for Susie and Kathy for bringing in and managing the horses - as well as to Ned, who taught me so very much! 'Just a Place' and 'January Thaw' both juried into the PAAC National Juried Fine Art Exhibition and Sale! I am thrilled to announce that 'Just a Place' and 'January Thaw' were both juried into the Plein Air Artists Colorado's 19th Annual National Juried Fine Art Exhibition! The show will be at Mary Williams Fine Arts in Boulder, CO, August 1-30, 2015. I feel honored to have art represented in this venue with so many talented artists! I have special thanks in my heart to all individuals involved with the organization, jurying and execution of this show! Thank you! It is insightful to me that both pieces were done in the field with strong focus and immediate enthusiasm for the subject. As a plein air painter, I often drive around casually searching for a 'spark' in my soul in response to what I am seeing. At times I have an idea of what I am looking for, but most often I just pull off the road and meander around with a sketchbook. Almost always, something strikes me as interesting... but sometimes, I cannot stop the truck soon enough...I am hooked from the first second! Both of these paintings were situations like this. For 'January Thaw', I saw snow curling off of this roof every time I drove to town and the temperature got above freezing. I observed it many times, always curious about how I would paint that crease of snow. Then, one day, the sun struck through the trees lighting it up as if by spotlight and I had to paint... THEN! (Groceries are not always that important!) I had two good hours before I was in the shade and feeling uncomfortably cold - which was just enough time! I knew that time was of essence and got my notan studies down quickly. It was a day of complete focus and satisfaction! 'Just a Place' was initiated by the fact that a cold wind was blowing and I was desperate to get out of it. I hiked around a few locations before spotting the sun hitting this concrete wall... out of the wind! When I started sketching shadow and light, I realized that many angles were coming together in a gorgeous composition. I recently took a week workshop with Jill Carver where she stressed multiple times the importance of seriously problem solving ideas with mini sketches prior to painting... like doing MANY studies before committing to a painting. This concept really came to fruition for 'Just a Place'. By the time I had done multiple notan studies, I knew exactly what I was focusing on and how I was planning on achieving it. Snow was not even completely melted at this point so colors were neutralized and subtle. I had so much fun painting this! All in all... you never know what will hit your soul with good focus... but when you find it... it is AWESOME! The opening reception will be at Mary Williams Fine Arts in Boulder, CO on July 30th, 5-8pm. I hope to see you there! I am honored and humbled to have studied with Jill Carver for a week in Texas. The workshop was stationed out of the West 1077 Ranch in Bandera where we were treated like royalty, ate incredible food and had insightful conversations amongst ourselves. What a week! The workshop itself was inspirational and FULL of concepts, specifics and thought processes. Jill shared many aspects of her painting process including basic technical perspectives, time management, ideas and focal areas as well as philosophies of working. It was an opportunity that I am thrilled to have had! My mind is swimming in potential! I have gained so much from the workshop. One practice that I am excited to hold dear is taking time for observation and analyzing what it is that I am observing - specifically. My primary interest in plein air work is observation, so it only makes sense that I would be as complete as possible with it. However, I learned in the workshop that I tend to get distracted by the quickly changing light and want to 'get to work' right away. Jill often had us on a timer where up to 1/2 of the 'painting' time was on doing notans, trying a variety of different horizon lines...or angle changes. The goal was to slow down and REALLY look at what had interested us and what our focal area would be...THEN paint. I LOVED the practice and found that I am much more grounded and confident as to what it is I am observing. Since returning from Texas, I have found that this practice alone has changed my world! My head is still swimming... but I am settling in to some of the things I have learned and am feeling very grateful! I have a special spot in my heart for Jill and the group of incredible artists that were there with me for the week! Spring has Sprung and there is Action! Spring has Sprung and there is action everywhere! These two pieces, 'Shift Change' and 'Cottonwood Stand', have both sold in the last couple of weeks! Both are done in pastel. I am thrilled that they have found happy homes - one in Queretero, Mexico, the other in San Antonio, Texas. Thank you to those who have purchased these pieces! I would like to put forth a special thank you to Guchiebird's in Driggs, Idaho for showing my work. I am heading out today for Texas to take a workshop with Jill Carver. I am super excited. Her sense of form is very strong... but her execution is fluid and loose. I think that I have much to learn from her... not to mention getting to interact with a group of incredible artists while there! Keep posted for my experience while in Texas. What a nice send off I have gotten over the last couple of weeks! A few months ago, I took a workshop with Time Horn, who paints incredible light on buildings and vehicles, among other things. During the workshop, I couldn't resist attempting my first vehicle. I had two hours until the car pool was leaving so I made haste! The layout (which is basically a drawing with brush and paint) went in quickly and reasonably accurate. I felt like I was on a roll! The wonderful experience was actually observing that the colors on the truck were reflections of the environment - not the truck itself. It is so obvious... but very exciting to truly observe it while painting! Oh so fun! Of course, I ran out of time. Lucky for me, Tim came over at the last minute and told me to get the highlights in quick - I only had 5 minutes! I wanted to fuss with colors and temperatures, but forgot all of that and just laid in highlights. What a difference that it made! I have worked a little more on this piece at home but have decided to leave it mainly the way it was in the field... it is too easy to loose the spontaneity that I love so very much. I will definitely be looking for vehicles to paint in the future! 'Cottonwood Stand' accepted into the 2015 Wyoming Governor's Exhibition! I am excited to announce that 'Cottonwood Stand' has been accepted into the 2015 Wyoming Governor's Exhibition! As I drove by this scene, I was captivated by the colors that were in the shadows and was immediately drawn into the location. It was completed on site, en plein air. ‘Cottonwood Stand’ is painted in pastel. It is 21x22". This little house in Mount Carmel screams to be painted in the morning light! The warmth that is reflected in the porch area is nothing short of striking. Between that and the shadows on the street in front, I was captured! I have spent the summer striving to keep on task with simplicity of subject and color relationships in order to clarify form to it's purest. This was a great subject matter for me to attempt. The trees behind the house quickly defined the space and value scale for me - I was pleased. Of all funny things, I had the most difficulty with the shaded area of the porch, wanting to redefine my drawing repeatedly... it took a fair bit of talking to myself to get it all figured out! I am thrilled with the reflected light that I got on the porch and find that I am still drawn to that warmth... I think that is a good sign! 'Reflected Warmth' is painted in oil. It is 12x12".